If you’ve ever swam in a lake, you know it can be murky, dirty, polluted, and not safe to drink. There are obvious signs that there are bad guys (i.e. bacteria, chemicals, parasites, and pollutants) lurking. However, in your tap water that flows into your home, some of these same bad guys are lurking — unseen and undetected — luring you into a false sense of security. 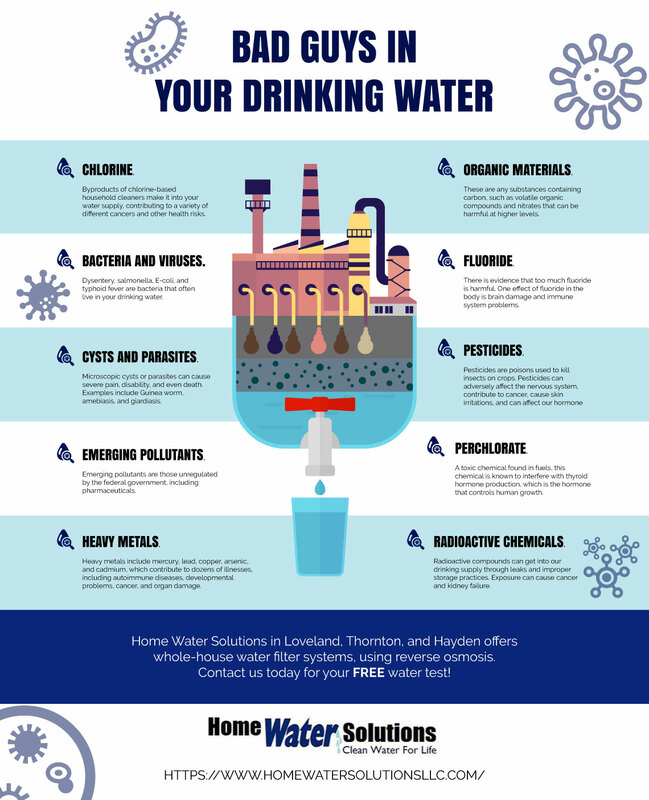 Home Water Solutions, with locations in Loveland and Thornton, CO, and Hayden, ID, offers the best whole-house water filter systems available. Using reverse osmosis, which is a process that filters water through membranes that remove most of the bad guys, Home Water Solutions cares about the water you and your family drink. Below, we’ll introduce you to some of the most common bad guys in your tap water that can do you harm. Contact us today for a free water test! Chlorine. Chlorine is added to pool water because it kills — literally. It kills bad guys (bacteria and germs) that may be floating around in the pool. Thus, if you drink chlorine, you’re ingesting a bit of this harmful ingredient as well. As a common ingredient in household cleaners, byproducts of chlorine easily make it into your water supply, often at levels higher than federal drinking water standard regulations. Chlorine can contribute to a variety of different cancers and other health risks. Bacteria and viruses. There are good bacteria (like those that help us with digestion) and bad bacteria (like those that make us sick). Most of us are familiar with the history of bacteria killing millions of people throughout human history. Before the link to these diseases was made to our drinking water, cholera epidemics raged. Dysentery, salmonella, E-coli, and typhoid fever are other bacterium that can often live in your drinking water. Cysts and parasites. Microscopic cysts or parasites can cause severe pain, disability, and even death. Examples include Guinea worm, schistosomiasis, amebiasis, cryptosporidiosis (Crypto), and giardiasis. When you drink water containing these bad guys, they infect you. Emerging pollutants. So named to differentiate these bad guys from regular pollutants, emerging pollutants are all those unregulated by the federal government. Some of these include pharmaceuticals and toxins from personal care products and from urine that is reaching our water supplies. Heavy metals. Heavy metals include mercury, lead, copper, arsenic, and cadmium. Heavy metals can cause or contribute to dozens of illnesses, including autoimmune diseases, developmental problems, cancer, organ damage, and more. Kids are especially susceptible to these toxins, causing both neurological damage and behavioral problems. Lead is the most famous of these heavy metal bad guys, having gotten into our water supply fairly easily from the widespread use of lead pipes and plumbing fixtures. Organic materials. Experts classify these as any substance containing carbon, such as volatile organic compounds. One common one found in drinking water is methyl tert-butyl ether (MTBE). MTBE was formerly used as an air-cleaning gas additive, and although banned now, it will take years to remove its byproducts from our water supply systems. This particular bad guy can cause leukemia, lymphoma, and tumors in the testicles, thyroid glands, and the kidneys. Nitrates from fertilizer can be harmful at higher levels, especially to pregnant women and infants. Fluoride. Fluoride, despite recent push backs, is still added to the water supply by many cities. Fluoride was sold as an additive to drinking water as a way to strengthen teeth. However, there is no evidence that fluoride benefits the human body in any way. However, there is evidence that too much fluoride is harmful. One effect of fluoride in the body is brain damage and immune system problems. Pesticides. Pesticides are poisons used to kill insects on crops. With so many in use, the effects on the human body varies. However, some affect the nervous system, contribute to cancer, cause skin irritations, and can affect our hormone and endocrine systems. Atrazine, a pesticide, is commonly found in drinking water across the Midwest and the South. There are calls to phase this pesticide out. However, as a newer pesticide, there are no definitive studies on what health conditions it can cause. It’s only makes our list of bad guys because it’s being found increasingly in drinking water supplies. Perchlorate. A toxic chemical found in fuels, this chemical is known to interfere with thyroid hormone production, which is the hormone that controls human growth. Radioactive chemicals. Primarily a concern for those who live near nuclear plants, radioactive compounds can get into our drinking supply through leaks and improper storage practices. Exposure can cause cancer and kidney failure. The only way to ensure your drinking water is a clean as water can get is to install a whole-house water filter system by Home Water Solutions in Loveland, Thornton, and Hayden. Water treatment plants, while good and obviously better than drinking unfiltered water, will never get out all the bad guys in our water supply due to the sheer amount of water that comes through their systems. With whole-house water filter systems, you are ensured every drop of your water is filtered thoroughly via our home water treatment processes. We offer a free water test, which will show you exactly what is in the water coming into your home. This can help you determine which kind of water filtration system is right for you. Home Water Solutions invests in the best water filtration system, using reverse osmosis. This process forces water through microscopic membranes that catches almost all the bad guys. You’ll enjoy better-tasting morning coffee to get you going in the morning, incredible pasta primavera, and a shower that won’t leave your skin itchy. You can rest better at night, knowing your pajamas were washed with reverse osmosis water, and when your kitty jumps up on your pillow, you’ll know she is healthy too, drinking the amazing water from your whole-house water filtration system. Give us a call today for a free water test to discover what bad guys are lurking in your water!